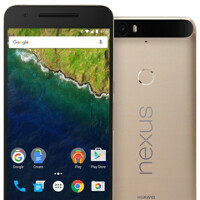 Over time, we've seen the price of the Huawei-made Google Nexus 6P being discounted by $50 through various promotions. If you've missed out on all of these discounts and you have your eyes set on a vanilla Android phablet, you'll probably be pleased to learn that B&H is currently selling the Google Nexus 6P at a $50 discount and will also throw in a $50 gift card with a purchase. Essentially, this amounts to a $100 discount on the current-gen Nexus flagship, which is a pretty sweet deal on one of the best Android phablets currently available on the market. Unlike previous promotions, which offered $50 off the gold-colored variant of the Nexus 6P, this deal applies to all color options - Graphite, Aluminum, and Gold - and storage sizes. The 32GB model will set you back $449, the 64GB model is priced at $499, while the top-end 128GB model is priced at $599. Again, B&H will also offer you a $50 gift card when you purchase a Nexus 6P, which you could use to get some protective cases or other accessories. If you were thinking about getting a selfie stick, don't bother: B&H will also throw in a free selfie stick with your purchase. Having launched back in October 2015, the Google Nexus 6P may not be the cream of the Android crop anymore, now that newer-gen handsets such as the LG G5 and the Samsung Galaxy S7 have reached the market. However, this doesn't mean that the second-gen Nexus phablet isn't an attractive phablet, especially at these discounted prices. As always, you should head on to our full Google Nexus 6P review for a detailed analysis of the phone. If you're looking for a refresher, however, bear in mind that the phablet's strong points include the vanilla version of Android 6.0 Marshmallow, the promise of timely security and software updates, a unique all-metal build. The performance is ensured by a Qualcomm Snapdragon 810 chipset paired with 3GB of RAM, a combination that ensures smooth performance across all tasks. On the downside, the camera isn't the best around, the display could be brighter while the battery life is below average. Good deal for the best nexus phone ever. "On the downside, the camera isn't the best around, the display could be brighter while the battery life is below average." o_0 Seriously? In my country it is $ 500 ! Google store, Newegg, and Bestbuy also have it for $449. Newegg includes a $50 gift card and a free case. Bestbuy a $25 gift card (a few days ago it was a $50, dunno why they changed it). No free extras from the Google store I believe though. what about $400 without giftcard and that stick?